East Quogue Tony's Sushi has been a Hampton's Tradition for over ten years. Now he creates a new dining experience. 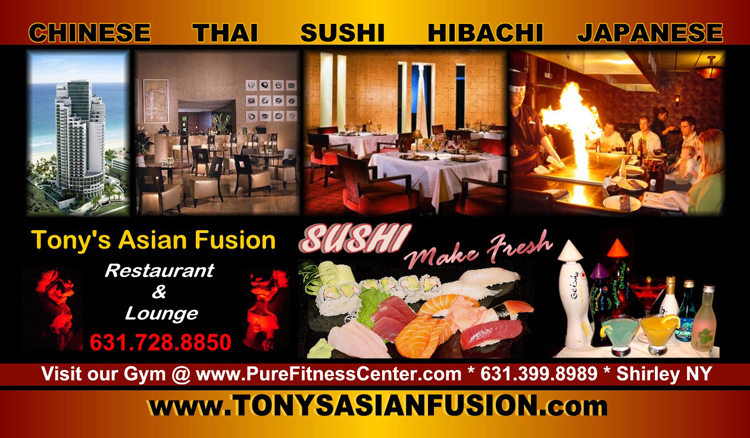 Enjoy great sushi, Chinese, and Thai specialties with Tony's unique flair. Enjoy a drink in the lounge and relax as you watch the salt water fish glide around the huge fish tank. This new restaurant is a MUST for all who visit the East End! If you fuse it, they will come. 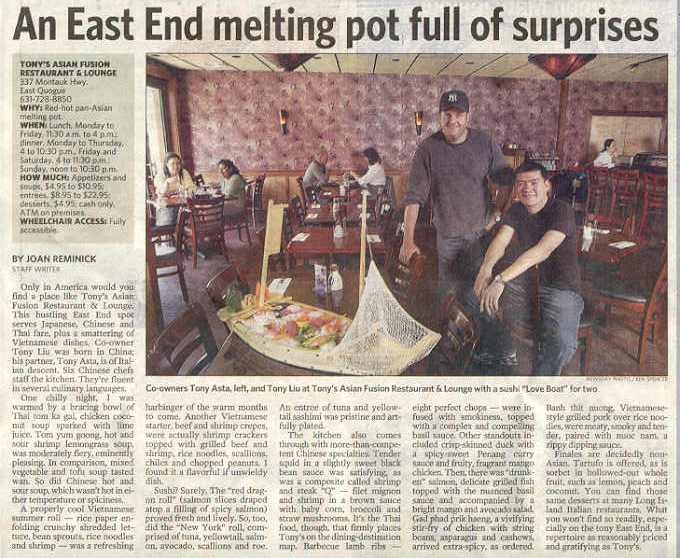 Tony Liu and Tony Asta, owners of Tony's Asian Fusion in East Quogue, flicked on the open sign switch a few weeks ago and, like flies to flourescence, the customers bowed to the centripetal force created by the convergence of Chinese, Japanese and Thai food in one kitchen. We've done no advertising, nothing, and every Friday and Saturday night we fill every seat and people are waiting to get in. It's probably every restaurant's dream to have that, but it's kind of been our nightmare." Tony Asta said. Mr Asta was referring to the little kinks that any restaurant experiences during its first few weeks of operations-coordinating the wait-staff, fixing computer problems-bugs that are exacerbated by dining rooms packed to the exits. But Mr. Liu, who ran Tony's Sushi in Hampton Bays and currently operates Tony's Sushi #2 in East Moriches, and Mr. Asta, a restaurant novice, say the issues are resolved, and they now welcome the throngs. Tony's Asian Fusion, which is open seven days a week, sits on the southside of Montauk Highway in the renovated shell of what used to be Tutto Mato. Inside, there are two main dining rooms that can accommodate a total of 100 people. The first shares the restaurant's front room with a full bar (liquor and sushi) and a tropical fish tank and benefits from the natural light filtering through the windows and glass doors. There are small Hardwood tables and chairs, sculptures of asian warriors, and muted purple wallpaper with Chinese characters. "Someone said it was kind of a Zen feeling." Tony Asta said, amused. "Someone told me that, I dont know." The back room is carpeted, a no-nonsense, dimly lit rectangular dining space, filled only with tables, small lights, and two-flat screened TVs on the walls. The whole restaurant has the feel of a lounge. There's a convenient ATM between the two rooms, a helpful addition, because Tony's is a cash-only establishment. The key to Tony's, Mr Asta said, is that everyone can find something appealing. Asian Fusion is not about cross-breeding cuisines, but simply gathering them together in one spot. Inevitably one person in a group going out to dinner "wont be into sushi," Mr. Asta explained. But those adverse to consuming raw fish might have a fondness for Chinese or Thai food. Tony's Asian Fusion then, is one-stop dining--or one-stop take-out--a night in or out for Asian food without having to make compromises. The menu is split into three sections for each cuisine. Japanese appetizers run between $3.99 and $8.99 with teriyaki or tempura platters between $9.99 and $15.99. Sushi entrees run between $12.99 and $18.99, with sushi and hand rolls all under $9. Chef's special rolls run from the tempura roll at $7 to the "Tony Roll" with spicy tuna and kani, eel and avocado or the tuna special roll, each at $14. Thai soups (under $5), salads and appetizers (generally between $4.95 and $7.95). There are 40 different Thai entrees, including vegetarian and rice and noodle dishes, which are generally available for $10.95 to $20. Chinese entrees include chicken ($9, beef ($9.50), pork ($8.50), and seafood ($12.50) dishes, as well as more than 20 chef's specialties, which include crispy duck Hong Kong style ($11.99), and "Happy Family," a dish with beef, shrimp, chicken, pork, and vegetables ($12.99). Ideally, Mr. Asato said, Tony's will become a regular haunt. Patrons of Mr. Liu's other restaurants have already come in, he said, to check out the new place. "This is a casual place, laid back," Mr. Asato said, "Straightforward."